Despite deforestation and human encroachment, the country’s forest cover has remained stable around 20% since Independence. This is because the loss of natural old-growth forests is compensated on paper by expanding monoculture plantations. Since Independence, a fifth of India’s land has consistently been under forests. The population has increased more than three times since 1947, and from 1951-80, a total 42,380 sq km of forestland was diverted — some 62% of it for agriculture. And yet, the country’s forest cover continues to hover just over 20%. 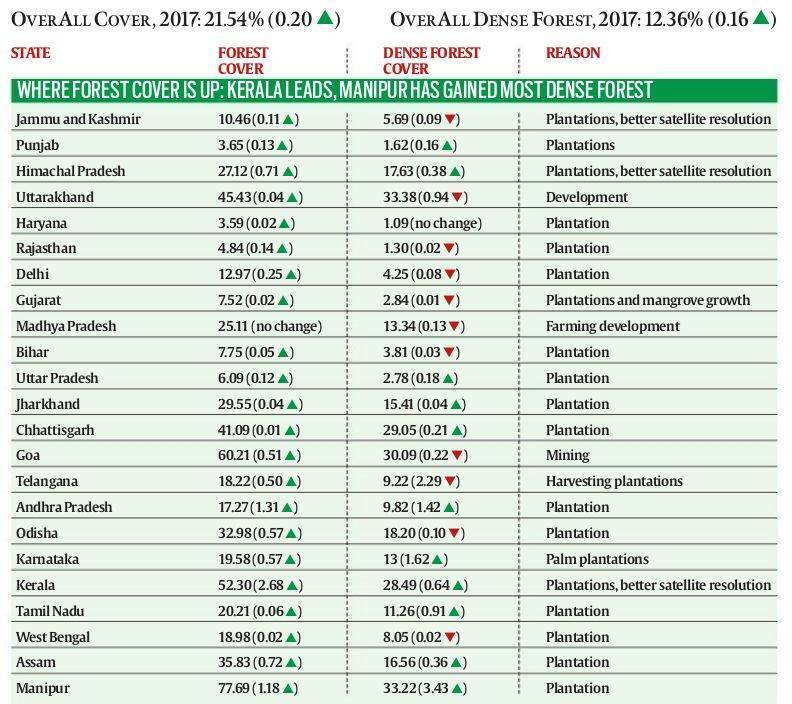 The India State of Forest Report 2017, released by the Forest Survey of India earlier this week, recorded that the forest cover had increased by 6,600 sq km — 0.21% — since 2015. For the first time since 2007, the biennial report recorded an increase of 5,198 sq km in “dense forest” (including Very Dense Forest, with a tree canopy density of 70% and above; and Moderately Dense Forest, with a tree canopy density of 40% and more, but less than 70%). These are happy numbers, considering India’s forest cover increased by only 67,454 sq km since the FSI’s first survey in 1987. Significantly, the latest biennial increase (2015-17) in dense forest is over 10% of the overall gains — 49,105 sq km — in dense forest made over four decades. Source: India State of Forest Reports. Click to enlarge image. It’s green, but is it forest? Given the relentless pressure on forestland, what makes such stability, even growth, in forest cover possible? One, the FSI uses satellite images to identify green cover as forest, and does not discriminate between natural forests, plantations, thickets of weeds such as juliflora and lantana, and longstanding commercial crops such as palm, coconut, coffee, or even sugarcane. Two, in the 1980s, satellite imagery mapped forests on a scale of 1:1 million, and thus missed details of land units smaller than 4 sq km. The significantly refined 1:50,000 scale now scans patches as small as 1 hectare (100 m x 100 m), and any unit that shows a 10% canopy density is considered ‘forest’. So, millions of tiny plots that earlier went unnoticed, now contribute to India’s official forest cover. The results are interesting. For example, the first FSI report recorded only 15 sq km of forests in Delhi, while the latest report found 192 sq km — a 13-fold increase in 30 years. Nearly a third of the current cover is recorded as ‘dense’. Similarly, highly agricultural Punjab and Haryana have managed to add more than 1,000 sq km each of forests since the 1980s. A dense forest (40% or more canopy density) can deteriorate into open forest (10%-40% canopy density) or can be wiped out all together, becoming ‘non-forest’. And open forests can improve in density, non-forests can grow into open forests and, over time, into dense forests. Over the last one and a half decades (2003 onwards, see chart), 15,920 sq km of dense forests have become non-forest areas. What partially offsets this loss on paper is the conversion of non-forest areas to dense forest every two years. Since 2003, a total of 8,369 sq km of non-forest have become dense forest. In the last two years alone, this has added 3,600 sq km under the dense forest category. But how could these areas with no forest become dense forests in just two years? The answer: these are all fast-growing plantations — not detected by satellites in the sapling stage, but considered dense forests once they’ve grown. Since 2003, India has lost over 1,000 sq km of dense forest every year, and compensated roughly half of that with plantations. The trend, if anything, is getting worse (see chart). Between 2005 and 2007, 2,206 sq km of dense forest were destroyed. A decade later, while the FSI claimed an impressive biennial overall jump in dense forest cover, we actually wiped out nearly thrice as much — 6,407 sq km — of dense forest between 2015 and 2017. The extent of the loss can be estimated from the fact that much of what is forestland on paper has little or no forest on it. Combining digitised data available from 16 states with the Survey of India’s topographic maps of greenwash areas (forestland) from the rest, the FSI identified 7,06,899 sq km as recorded forest area in India. Of this, the 2017 report says, 1,95,983 sq km — nearly 28% — has no forest cover at all, and only 3,26,325 sq km — about 46% — is densely forested. In other words, forestland roughly the size of Gujarat has been wiped clean of forests. Also, less than half of India’s forestland is dense forest. If almost 600 sq km of this forest-land-without-forests became forested between 2015 and 2017, the bad news is that over 1,000 sq km of forestland lost dense cover during the same period. Indeed, the forest data is less than the sum of its parts. After four decades of surveys, it is probably time for the FSI to consider reporting India’s green cover under more explicit categories, including plantations, orchards etc. It could also help to make the GPS data for each forest unit available for public audits.